Crepis capillaris..PNW Weed Management Handbook.Robert W. Freckmann Herbarium, University of Wisconsin-Stevens Point. wisplants.uwsp.edu. (Accessed 5/2014). Crepis capillaris is an annual or biennial herb, to 90 cm from a taproot, sap slightly milky, stem often freely branched, stem rough-hairy near base, plant sometimes pale, waxy-green. Leaves alternate, mostly basal, to 30 cm long, 4.5 cm wide, basal leaves stalked, lance-shaped, toothed to deeply lobed, lobes pointed, stems leaves becoming smaller upwards, clasping stem, base with pointed lobes. Flowers yellow, heads numerous, small, bracteate base 0.5-0.8 cm long, wooly-hairy, hairs sometimes glandular, inner bracts 8-16, outer bracts linear, to half as long as the inner, flowers 20-60, July-Oct.
Fruit dry, one-seeded achene, ca 0.2 cm long with a plume of capillary bristles. 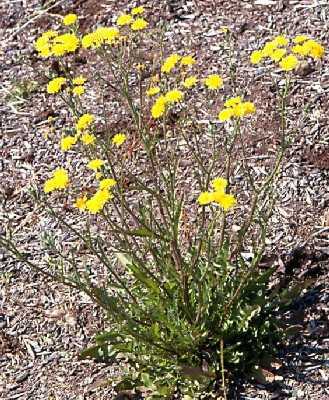 Habitat: A weed of lawns, gardens roadsides, open areas.